While traveling in business or pleasure there is always the need for an alarm clock, be it for early meetings or for that afternoon party on the hotel pool that you can’t miss, it all depends on the scenario but one thing is for sure – you need to wake up in a happy mood or else the first hours of the day will be a disaster. 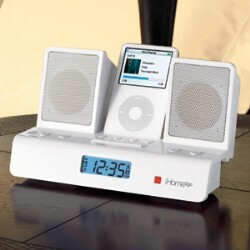 instead of the irritating and normal “beep” sound that 76% of the worldwide alarm clocks have, you can place your iPod in the iHome2Go and start listening to the songs. instead of the absurd and unique (in time) “sleep timer” setting that 56% of alarm clocks have, this one has four options – 90, 60, 30, or 15 minutes. My Sony alarm clock only has a 60 minute sleep timer setting, no other options, and that is why I find this programmable timer so useful. recharges the iPod exactly when you need it, which is when you are sleeping. The volume will gradually increase or decrease if you are trying to sleep or trying to wake up.